On the welcome page I referred to becoming troubled by many of the teachings and practices of the Catholic Church during my later years at school. These never bothered me as a child when I’d willingly accepted the religious instruction given by priests and schoolteachers. 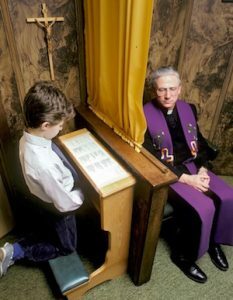 For example, I eagerly absorbed the lessons on sin that prepared Catholic children for the sacraments of confession and communion. We were taught that there were different types of sins. These included mortal sin, which covered the worst types of sinful acts such as murder, abortion, blasphemy and missing Mass on Sundays or holy days, and original sin which every soul born to mankind apart from Jesus has inherited at birth through the disobedience of Adam and Eve in the Garden of Eden. One Sunday, several months after my first communion, I caught a slight cold. I wasn’t particularly ill but I convinced my parents that I was too poorly to go to Mass. I can’t recall why I wanted to stay at home but I vividly remember lying awake with worry that night. What if I die in my sleep? There weren’t any church confessions until Saturday so what if a car was to hit and kill me before then? Fear gripped me. I prayed so hard to Jesus each day that week, asking him to keep me alive until I could confess my sins. Even after my confession I still felt the deep guilt and fear that had haunted me since the previous Sunday. It’s perhaps no surprise that I attended Sunday Mass without fail for many years afterwards. When I reached my teenage years, I began to question some of these core principles of my faith and in particular, the Catholic doctrine regarding sin, heaven and hell. I remember a classroom discussion with a priest about baptism. (I went to Catholic schools so many of my teachers were either priests or nuns). One of my classmates pointed out that many babies live for only a few moments after birth whilst others are born into parts of the world where the Catholic Church doesn’t even have a presence. Would God really deny them entry into heaven? After all, these babies were not in any way responsible for missing out on their baptism. I pushed this point a little further. Some children have the good fortune to be born to saintly parents living in caring communities. Others are less lucky and are born to violent, immoral parents who mix with criminals. Those children who are well raised clearly have a far better chance of leading a life which merits a place in heaven than children who are brought up to follow a path of crime. Surely this can’t be fair? The priest had a stock answer when cornered by challenging philosophical questions such as these. I’ve forgotten the exact words he used but it was something like, “We shouldn’t expect to understand the mind of God”. This wasn’t however an answer that did anything to alleviate my concerns. 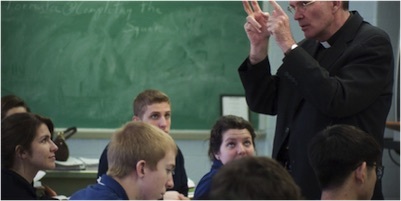 On the contrary, it left me in even more doubt about this and many other aspects of the Catholic teaching. I yearned for some certainty about what happens to the soul after the death of the body – eternity is a LONG time after all – but I no longer believed that Catholicism had the answers. I retained my faith in God and Jesus but gradually stopped attending church services. However I didn’t completely lose interest in spiritual matters. I was curious about other religions and beliefs and happily watched TV programmes that might help me to learn more. I particularly remember an intriguing programme about regression therapy which showed a psychiatrist hypnotising various individuals who then appeared to recall past life events. Although the programme didn’t totally convince me, the evidence presented in some of the case studies was quite compelling. It certainly did enough to open my mind to the possibility that we live more than one life. I became even more convinced after attending some of Carol Lamb’s seminars. Since childhood, Carol had been able to spontaneously recall memories from her own past lives. Her desire to understand these and other paranormal experiences eventually led to her work as a soul recall therapist, helping clients to access their own prior life memories. By the time I met her, she had already conducted thousands of soul recall sessions and these, along with her own childhood experiences, had helped her to acquire a unique understanding of the nature of consciousness and the journey of the soul. The philosophy that she taught was based on ancient wisdom but she could illustrate it with numerous case study examples which showed how it played out in everyday life today. She had literally lived the teaching that she gave through her seminars and training courses. I soon realised that this philosophy addressed many of the difficult questions which my schoolteachers and priests couldn’t answer. It also helped me to understand the significance of a number of unusual events from my past. Consequently, I began to feel that it must be true even though believing in reincarnation conflicted with my Catholic upbringing. This troubled me a little but my concerns began to ease when I learned that Jesus had also taught the doctrine of reincarnation. According to Carol, Jesus was a highly evolved soul who had previously experienced many lives on earth. He had already cleared all his karma prior to his incarnation as Jesus, which was a unique and divinely ordained mission to the earth. One aspect of his mission was to teach and demonstrate the ascension of the soul. 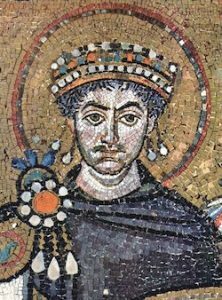 The early church had continued this teaching but frequently reviewed and modified elements of it until the Emperor Justinian finally ended the debate by declaring belief in reincarnation to be a heresy at the 5th Ecumenical Council in 553AD. I was immediately struck by the similarity between Carol’s beliefs about Jesus and the Catholic teaching concerning original sin. Catholic tradition declares Jesus to be the only soul born to the earth without original sin while Carol claimed that Jesus, unlike the rest of us, was born to the earth without karma. As I reflected on this, I realised that removing the doctrine of reincarnation would have given the church a problem. After all, if a soul has only one life, how can it already have any karma at birth? It seemed clear to me they would need to find another way of distinguishing between the purity of Jesus’s soul at the moment of birth and other souls born to mankind. The concept of original sin provided the perfect solution! This realisation convinced me once and for all of the truth of this teaching and my experiences in the years since then have only helped to affirm my conviction. I now have a very clear spiritual belief which helps me to make sense of the world around me and to understand the path of my soul. It’s now many years since I rejected the teaching of the Catholic Church but I don’t regret being raised into that faith. Today, the Church is in a state of crisis and is rightly being condemned for its many failings, past and present. It may even fall completely due to the abuse scandals which continue to emerge in almost every country with a Catholic presence. It has though kept the word of Jesus alive for over 2000 years and is the reason why millions around the world, including myself, are aware of his life and his ministry. I am now on a very different spiritual path but I know that my Catholic background helped me to find it. For that, I will always be grateful.